Sending targeted emails is a powerful way to engage customers. It's particularly powerful when the emails are personalized based on the customer's behavior. In this article we’ll review data you can collect using Email tools and how to choose the right tools to meet your needs! Email tools let you send targeted emails to each customer. They can be triggered by a particular action (email people 43 minutes after they sign up to see if they need help) or by inaction (if someone doesn't fully activate after 8 days, email them a pitch on the value of finishing setup). Similar to other avenues of data collections, in order to send emails with this kind of fine-grained targeting, email tools need to collect two types of information: who is the customer (identify), and what are they doing (track). 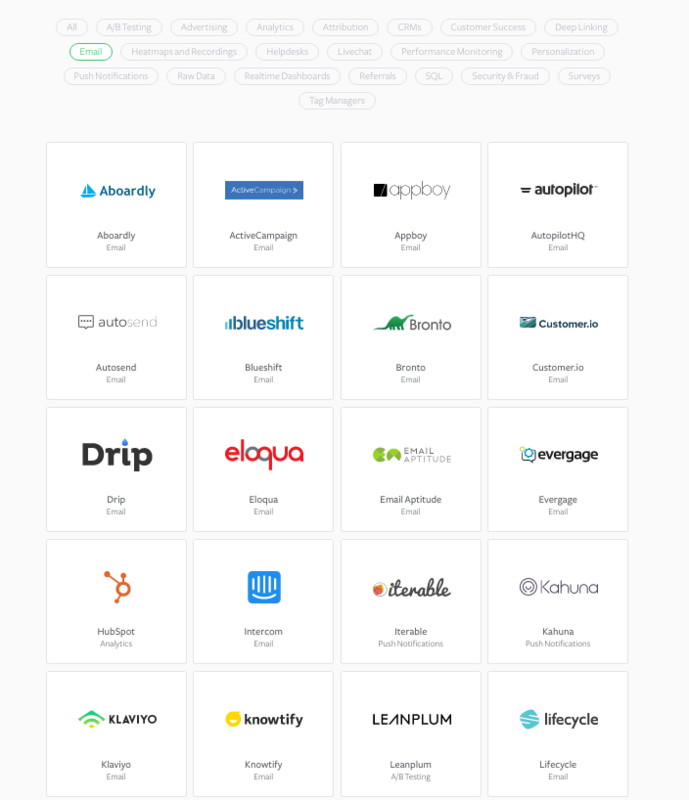 When thinking about which email tool to choose, you can evaluate them based on the main capabilities listed below. Let's dive into each type and the respective tools they support. List-based email campaigns allow you to send send mass information such as coupons, newsletters or email promotions. They help you keep your lists clean by managing bounces and unsubscribes and offers targeting options to make sure your content reaches the right people. Mailchimp is a web-based email marketing services that help you design email newsletters, share them on social networks, integrate with services you already use, and track your results. Transactional email tools are event based email campaigns that can craft emails to fill very specific needs. These tools track just about anything on your site, whether you’re an e-commerce vendor or a blogger, or a SaaS company trying to promote a new feature, you can trigger emails for just about any behavior for example: sign-up or password change. Sendgrid Threads which allows you to send events to Threads and track user behavior and create Workflows. 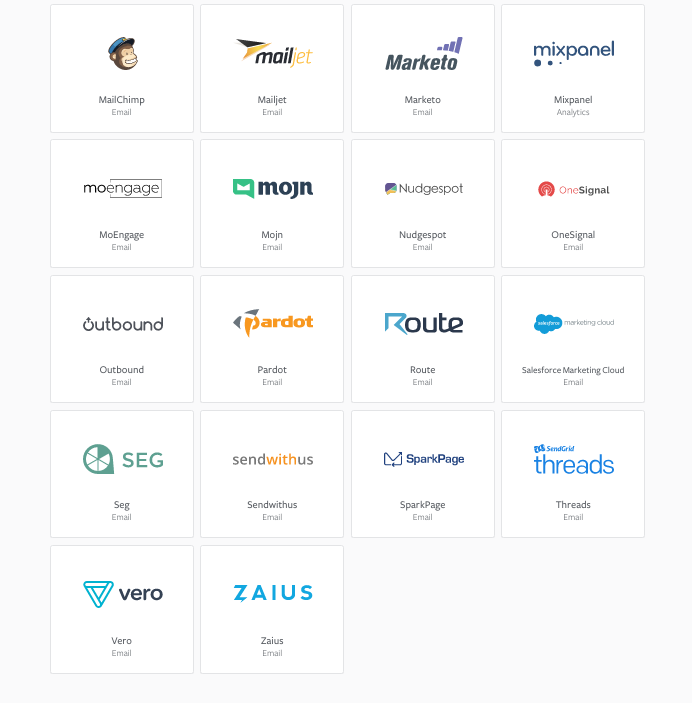 In order to send an email, you’ll need to connect to a SendGrid account. Threads uses SendGrid to deliver your triggered emails to your users. To create a series of automated email campaigns that are triggered by a defined user action and/or event (i.e. signed up, visited XYZ page), you can design email templates that are sent in workflows. Mojn links user behavior across channels by using CRM data and device ID's. Knowtify drives better engagement by providing user level information on detailed profiles that give you views of your customers. Their customer engagement score is pretty unique where you can easily see which of your customers are engaged and which are not. Multi-Channel Communication tools allow you to send information in a variety of forms. Iterable supports blasts, triggered and transactional campaigns, personalized templates, dynamic workflows, and A/B testing. Outbound makes it easy to send email, push notifications, SMS and voice messages when you need your users to take an action. Email blasts that go out to your entire list might help some people, but others will be left confused and in the dark. By personalization and list segmentation: you can slice your email list into segments based on what you know about each user—their buying habits, familiarity with your company, or professional background—then you send each segment of people personalized information. If you get your segments right, your users will receive relevant emails packed with information that they actually want. That personalization leads to more conversions, more purchases, and happier customers. Eloqua, Marketo, Hubspot and Pardot are the "old guard" of powerful email tools. They're much like Customer.io and the other new startups, except they focus on huge enterprise, and have feature-bloated, complex interfaces. Marketo is a good option if you're focused on pageviews and need to tie into Salesforce. And for enterprises looking into lead nurturing, landing pages, revenue reporting, platform integration. It has all the functionality you need if your small to midsize company. Eloqua is good for a midsize or large employer. They have referrals for additional services/partners. Hubspot does email as part of a larger suite of tools and has a complete all-in-one marketing suite with email, CRM, analytics, landing pages, etc. Mixpanel and Hubspot do email as part of a larger suite of tools. Intercom has an in-app widget for communicating with customers while they're on your site. Hubspot has a complete all-in-one marketing suite with email, CRM, analytics, landing pages, etc. Mixpanel does analytics mostly, but recently added email, surveys, in-app messaging and push notifications. Drip is a more lightweight marketing automation tool. Drip allows you to build a visual workflow that includes defining goals, implementing campaigns, identifying your best leads, and tracking your performance. Active Campaign offers email campaigns, marketing automation and sales/CRM features.